Company History | Willard Agri-Service of Frederick, Inc.
At Willard, our vision is to grow and sustain mutually beneficial partnerships with our customers. 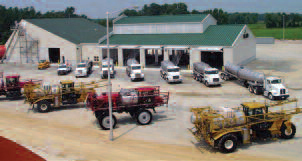 In 1970, De opened his first liquid fertilizer company to meet the growing needs of his customers. 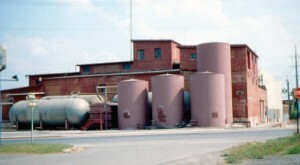 The Frederick, Maryland plant was one of the first in the area to manufacture liquid fertilizers and today is still serving Maryland, Pennsylvania, Virginia, West Virginia, Delaware and New Jersey. By maintaining De’s original focus on the customer’s needs and profitability, Willard Agri-Service of Frederick, Inc., has grown to now include five plants serving the Mid-Atlantic region. We employ over ninety of your neighbors who are constantly looking for new and better ways to serve our customers. Meeting our customer’s needs has always been our number one priority. In the 1960s, The fertilizer most farmers used was dry. Large, fan-like devices spun granules onto the field, where the coverage and effect were uneven. Then Allied Chemical Company developed an alternative: a liquid form of nitrogen that could be spread more uniformly and applied at the same time as atrazine, a herbicide used on corn. Intrigued, De Willard researched the product, studying brochures supplied by the Tennessee Valley Authority. His investigation convinced him that liquid fertilizer had great potential for his farming customers. He also realized that his Poolesville operation lacked the transportation links that would make the manufacture of liquid fertilizer feasible. We needed to be on the railroad, De said. By chance, a neighboring John Deere dealer had bought a defunct dairy plant in Frederick that sat directly on a rail line, and he agreed to rent part of the building. De launched Willard Chemical Company, Inc., at the site on January 13, 1970. Railroad cars delivered phosphate, potash and nitrogen to the siding, and crews mixed the first loads of fertilizer in the old dairy. That year, the Frederick plant blended 1,800 tons, for a net profit of $1,800. At the same time, a new method of planting was taking hold in the mid-Atlantic region: no-till farming. The new approach, which planted seed without tilling the ground first, offered savings in labor and equipment cost, and a way to reduce the amount of soil lost after traditional plowing” important for conservation, and well-suited to rocky soil. But growers needed to treat the existing plant growth with Paraquat (a new plant defoliant) before they planted. Thorough cover age was required” and the application techniques and equipment Willard was introducing fit the bill. 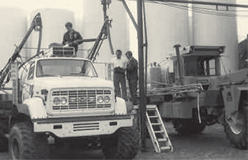 In the early ’70s, several new employees joined the company, and their contributions paved the way for further growth. Many of those who joined at that time are still with Willard today: Randy Bollinger, Larry Martin, Pete Surgeon, Jim Meyers, Jim Beyer and Charlie Leyhe. Communication in those early days was basic” especially by today’s standards. Sales reps hand-wrote their orders and spent long evening hours on the telephone, relaying information to plant managers and drivers. If a question came up during the work day, reps drove miles to find a phone booth. Willard soon found a better way, installing state-of-the-art two-way radios in 1972 to keep employees in touch. Computers came next. In 1976, Willard entered the electronic age, purchasing an IBM System 32 computer to expedite operations. Jim Willard, who served as the company’s first tech director, launched the use of formulation programs to create custom fertilizer blends according to soil samples. By 1977, the company was poised to expand. It purchased 15 acres of farmland in still-undeveloped Mt. Airy, Maryland from Colonel E. Brooke Lee to build a new facility for Meyers Liquid Fertilizer, which it had acquired in 1973. (Randy Bollinger, who was there when they dug the first shovel, still serves customers who have been with Willard since the plant opened.) Willard installed tanks 20 times larger than those in Frederick, and erected a pre-fab concrete building. A second building followed in 1980, and a third in 1999. Meyers Liquid Fertilizer was later renamed Willard AgriService of Mt. Airy. Bigger became the norm in the farming industry, too. Growers began using larger equipment, capable of handling many acres in a single day, said De. Increasingly, they came to rely on our services to do their fertilizer and custom chemical work for them. Maryland’s Eastern Shore, home to a large portion of the state’s agriculture industry, was a natural area for Willard’s continued growth. 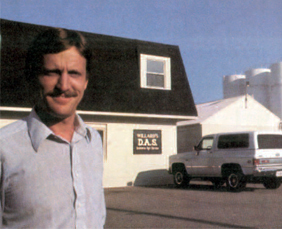 In 1982, the company purchased Flo-N-Gro, a liquid fertilizer firm in Lynch, Maryland, from John Byler. Bobby Willard left Frederick to head up the new location. David Baxter, Sr., and Robert Buster Ryans, formerly of Flo-N-Gro, were among the first employees; both are still with Willard. With two well-used sprayers and a couple of old trucks, the enterprise struggled at first. We began with a few customers”we had to start over and build our reputation, because integrity and reputation in small communities are just essential, Bobby remembered. It was a difficult beginning. In 1983, the federal government offered PIK (payment in kind) to farmers, paying them not to produce crops because of large existing surpluses. Farmers that did choose to grow suffered from a severe drought that summer. In farming, it all comes down to whether it rains, reflected Bobby. If not, you watch all your year’s work go for naught. The mood here was horrible”we knew farmers were suffering. Despite the early obstacles, the plant made gains. Lynch has become the company’s single largest location, and maintains a significant market share of the area. A year later, Willard looked north to Pennsylvania and began to build a new plant in Marion. Supervising design and construction from the outset was Pete Surgeon, an eight-year veteran of Willard. Hired by Larry Martin while he was still in college, Pete was a key figure in the Marion project. De had been through the process before in construction of the Mt. Airy plant. The lessons that he learned during that project were very helpful in the design and layout of Marion, noted Pete. We modified the orientation and layout slightly to fit the Marion site better. De constantly monitored the construction progress, and gave his insight into each phase as needed. At times, he would show up and get his hands dirty, too. The Pennsylvania plant went online in March 1985, just before spring season commenced. The staff included Rob McKoy, Dave White, Nelson Oberholzer and Ronnie Martin, with Larry Tarman joining the next year. Willard customers in the area already numbered more than 100, and the new facility extended Willard’s reach from West Virginia and Maryland north to the Cumberland Valley. Across the country, environmental awareness was beginning to grow. Although Maryland had not yet instituted regulations concerning safety features such as dikes and containment at fertilizer plants, other states had begun to enact them. Willard chose to be proactive in its approach, and asked the Tennessee Valley Authority to conduct a comprehensive assessment at the Frederick location and make recommendations that would enable the facility to exceed the toughest state and federal standards in existence. 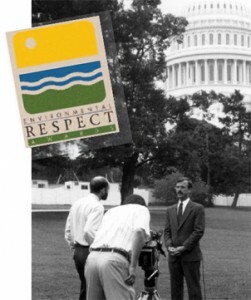 From 1990 to 1997, the organization worked with TVA to conduct an environmental makeover, said Billy Willard. We achieved the goal of zero discharge, and became a national model for the Tennessee Valley Authority’s National Fertilizer and Environmental Research Center. It was a new chapter for Willard, and one which would shape the company for the new millennium. The TVA project sparked a new culture throughout the company, a new awareness of environmental stewardship, and a new beginning, said Billy. It’s something that we continue to live and embrace. The Frederick facility was selected to receive a 1991 state and regional Environmental Respect Award bestowed by DuPont Crop Protectants, honoring environmental stewardship among U.S. fertilizer/agchemical dealers” one of eight finalists from more than 400 companies in 30 states. Similar honors followed for outstanding environmental standards and safety at other Willard plants. DuPont named Meyers Liquid Fertilizer in Mt. Airy a state and regional winner of its Environmental Respect Award in 1993, and the Lynch facility as a state and regional winner in 1997. In 1993, Willard also established a board of directors, gaining the business counsel of professionals outside the company. Waddy Garrett and Bernie Grove continue to serve as directors, with Hovey Tinsman, H. Carter Myers, Larry Martin, John Olson, Mike Twining and Ken Fry. In the same year, Paul Kostreski joined the company. With a graduate degree in information systems, he was hired as a financial analyst, but his role soon evolved. He became Willard’s go-to person for technology, refining and updating its fertilizer formulation and plant automation systems. 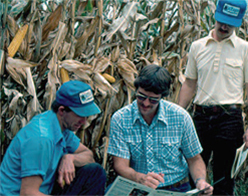 Willard took a bold step into the future in 1996, when Bob Willard asked consultant John Dantinne, an agronomic researcher, to look into how the company could enter the field of precision agriculture. I initially thought that we would be doing variable rate application, but John, along with an associate, Dr. Joe Russo, developed something new: a decision support system, which took data from a yield monitor in the combine and turned it into information the farmer could use, said Bob. John came up with the name HighQ® a variation on I.Q. With the information we gathered, the growers could figure out how to grow more bushels per acre and increase their profit. It perfectly fit our mission to increase profitability per acre. It was way ahead of its time, and still is today. Recognizing the potential, Willard Agri-Service adopted Dantinne’s idea and moved quickly to integrate the HighQ® Decision Support System with the firm’s operations. Larry Martin credited De’s business acumen on the decision. De was the leader in getting information to increase yields, he commented. He recognized how this technology would take us into the twenty-first century. The HighQ® system was inaugurated at Lynch with six growers and quickly proved successful. Farmers who utilized the program realized gains in production, and the system’s built-in data collection fit seamlessly with the demand for farmer accountability. Having HighQ® computers in our tractors for data collection fit so well in our business, noted Ken Fry, general manager at Lynch. We can analyze and recall data easily for the customer. With state and federal governments requiring growers to provide such data to comply with regulations, the system has become even more valuable for growers. Willard currently employs five HighQ® techs who are making the system work for farmers. The value of the HighQ® system continues to grow, said Billy Willard. Because we’re tracking lots of acres” about 500,000″ and lots of farmers, we have quite a pool of data and experience that we can share with our customers. In 2003, Willard’s Marion plant reached the pinnacle of environmental safety standards, earning the DuPont Environmental Respect Award as the most environmentally sensitive ag retailer in the nation. The Pennsylvania facility was honored as embodying a personal and professional commitment to safety on a long-term basis. In the same year, the company decided the time was right to move ahead with plans for expansion in Greenwood, Delaware. (Although Willard had purchased the property more than two decades before, the acquisition of Flo-N-Gro in Lynch delayed development of the project.) The facility was new from the ground up, except for the landmark silo, which remained on the property. It opened in 2004 with growth as its objective. â€œGreenwood is the culmination of 30 years of liquid fertilizer experience “everything we’ve learned from other facilities, said Bobby Willard. With its third large storage tank now complete, the plant manufactures 30,000 tons of fertilizer a year. The difference at Greenwood is that it’s more diversified, explained general manager Mike Twining. We do more for specific markets, like large industrial power plants, drip irrigation, and turf and lawn care, in addition to ag. More of our fertilizer leaves on a truck than on a spreader. Like other Willard facilities, Greenwood is over-engineered and built to exceed regs, said Twining. There’s zero discharge. State inspectors have told us that the water in the pond is cleaner than the water from our 400-foot well. Willard recently entered into a partnership with Southern States to allow them to warehouse nitrogen at the site, which Twining said reflects Willard’s reputation for environmental stewardship. In 2004, a new opportunity emerged in Pennsylvania, where Willard established a partnership with Ken Clemmer to form SynaTek, which provides fertilizer, crop protectants, grass seed and equipment for golf courses and lawn care. Continuing its search for ways to utilize its plants for additional purposes, Willard also began studying the use of materials to reduce NOx emissions. It joined with Colonial Chemical in 2004 to service industrial markets with products from its fluid manufacturing facilities. Three years later, the Agricultural Retailers Association (formerly the National Fertilizer Solutions Association) elected Bobby Willard as its chairman. The event, recognizing a second generation in the industry’s leadership, was the first in the history of the organization. In December 2009, on the eve of its 40th anniversary, Willard Agri-Service was named the nation’s top agricultural retailer of the year. The award, announced by the Agricultural Retailers Association, recognized Willard’s leadership in providing high-quality agricultural technology and customer service to more than 2,800 growers in the mid-Atlantic.